A chainsaw is a very useful tool for cutting or trimming back trees and bushes, especially thick wood. The part that is most important is the chainsaw bar as this is what makes the cutting of wood effective. It works as a guide so that the chain can move in a loop and create a cutting motion. The chain has sharp teeth which, when moving in the loop, are very effective at cutting through almost anything. The firmness of the bar is one of the most important things to look for when shopping for new chainsaw bars. This is how you can make sure you are safe, and perform its job better. Whether your bar has worn out, or you’re choosing a different size to attach to your chainsaw, we can help you. This buyers guide will pick out the best chainsaw bars on the market so you don’t have to. This bar is considered one of the best on the market and is designed to help your chainsaw perform to it’s best. This is the perfect bar for when your original one has worn out and you need a replacement. It fits most of the STIHL chainsaw models as well as some other products. There is a multi-rivet nose at the tip of the bar which means it can take on challenging tasks while still being durable. Inside the bar is an Intenz tensioning system which is used to tighten or loosen the chain depending on what job you are doing. Another interesting feature is the LubriTec mechanism which keeps the bar and the chain oiled. It also met the ANSI standards for a low kickback on the bar and chain. One special feature is the ControlCut saw chain which is great for light work as it gives you a very smooth cut every time you use it. It is also very easy to maintain and the ControlCut feature can last during longer, and bigger jobs. 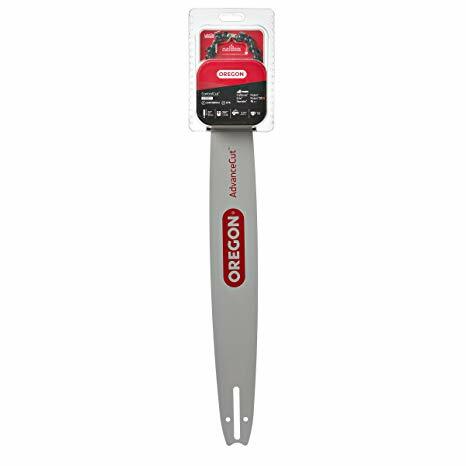 It has a semi-chisel and Micro Chisel styles of cutting which are suitable for those planning on cutting down trees or experienced landscapers. This bar is lighter in weight than other bars and is made using the corrosion-free material. It also has a unique design which means you have better stability and longevity from the bar. The length of it is suitable and will ensure that the chainsaw can comfortably drive high range sprockets. Another advantage of the length is that it will enhance the performance of your saw as well as be saving you time. These chainsaw bars are often used amongst professionals. They fit easily to many of the chainsaw models which include a 455 rancher or 55 ranchers. 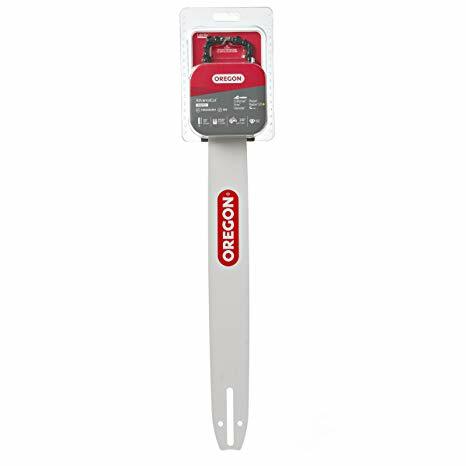 Its pitch is 3/8 inches which means it performs well when cutting thick lumber or wood. It’s is also specially designed for reduced-vibration meaning you won’t become fatigue with heavy vibration and you can work comfortably and safely. 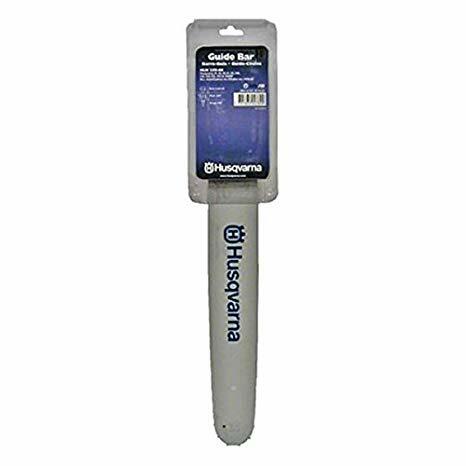 It is also well designed for garden use as well, so you can trim your hedges or even use it for carving tasks which might require accurate cuttings. This chainsaw bar is very lightweight which means you can carry and use it without getting tired. It is also very durable and lasts for a long time, even after many uses. This chainsaw bar has been designed with safety and ease of use in mind, as well as the power and acceleration. This means it’s powerful and efficient but is not too difficult to maneuver. Using Husqvarna chainsaw parts will ensure that your products last for a very long time, with even better performance. Each bar and chain are tested rigorously to make sure they work optimally with your chainsaw. The lower emissions and fuel consumption of a Husqvarna chainsaw and accessories will ensure that you save money, while still maintaining high-quality performance. Can be too loud to work with comfortably. This bar and chain combination is perfect for home duties and gardening. It has a special combination of guide bar and chain which means you get the most precise cut possible in every job you do, including accurate measures depending on what you need. Its length is very convenient and will adhere to the most prominent of saw patterns. This bar and chain are of exceptional quality, and not only that they offer vibration-free performance meaning you remain comfortable and safe while working. It boasts a high-tech design while being made from very durable materials. These factors mean you have a bar that will last for a very long time while maintaining it’s excellent performance. It also has advanced technologies which will give you tough and sharp cuts. One advanced feature is the AdvanceCut Guide Bar which is perfect for homeowners who cut trees in their garden, farmers, and firewood cutters. It gives experienced users power and reliability when using the chainsaw in challenging conditions. The multi-rivet nose means the bar has a better durability, while the AdvanceCut gives you better maneuverability while still being light-weight, meaning you can get the job done quickly. Other features include the multi-rivet nose, LubriTec to keep the chain and bar oiled, and the Intenz tensioning mechanism which adjusts the chain depending on the job. It only takes a few minutes to install and then it is ready to use. This chainsaw bar will be reliable and easy to use, compared to other models. The design of this bar is also symmetrical which means it is reversible which gives it even more of a boost when it comes to longevity and performance. The 18-inch guide bar and chain combination will fit the most popular brands such as Homelite, Poulan, and Craftsman. For professional work the Husqvarna Chainsaw Bars are highly recommended as they are strong and durable. These chainsaw bars are perfect for those professionals who are in demanding situations and conditions. With corrosion-free materials, the chainsaw bars last for very long time, even with regular work. They have high-quality power and fit almost any chainsaw. Its length is 18” and its pitch is .325 inches, while the gauge length is about .050. It comes with low-vibration so you can be safe and steady when using it for its high performance. These bars are also very well designed for home use, such as in the garden trimming the hedges. You could even use these bars for carving tasks as they can give you very accurate cuttings which you might expect from other chainsaws. It is designed to be very light-weight and efficient. It is portable, meaning you can carry it around with ease. Even when using it, your arms are less likely to get tired due to its light-weight equipment. All Husqvarna chainsaw bars are designed with safety and ease at the forefront of their mind, while still focusing on its quality of power and acceleration. This makes the product very easy to use and install while giving you ease of maneuvering it, making your job a lot easier. Each bar and chain is tested rigorously to ensure that they work at their best with whichever chainsaw you attach it to. These parts will last for a very long time due to their durability and low maintenance. A Husqvarna chainsaw and their parts all have a much lower emissions rate and fuel consumption than most of its competitors. This means you can save money and carbon footprint, while still gaining exceptional service from your chainsaw bar and chain. This is another of the best chainsaw bars on the market at the moment. It is made from high-grade steel which makes it incredibly durable as well as being heavy-duty. This material is unlikely to corrode or break and will remain strong for a very long time. It is also a high-quality material and so the work done by such material will always be of high-performance. The sprocket is star-shaped and located at the nose of the bar. This acts as a guide for the chainsaws cutting chain which makes the bar much easier to control and move around. The maneuverability of this model is extremely easy to manage due to the unique shaped sprocket. This star shape of the sprocket also prevents the chain from slipping which saves you time in the long run. There is a three-part set up design which is then spot welded into the laminated guide bar. The lamination is an important feature as it reduces the weight of the bar by a considerable amount. This means you will not feel burdened or fatigue while using this product, or afterwards. This also increases the maneuverability of the chainsaw in general. This bar can be used by people who have different relationships with chainsaws. It can be used by those who only use a chainsaw occasionally, such as in the garden or trimming hedges, by those people who would use it in a mid-range fashion, or it can be used even by a professional user due to its heavy-duty materials. Either way, it will perform to a very high standard. It can be confusing when trying to find the right bar for your chainsaw, especially when most specifications are actually to do with the chain that comes with it, rather than the bar itself. If you already have a chain, you need to look specifically at the bar requirements you need. Luckily for you, we have some hints and tips to help you know what to look for when considered a new chainsaw bar. Type of Chainsaw — This is the most important point as the length of the bar you choose should primarily be determined by the type of chainsaw you have, otherwise something very dangerous could happen. The type of chainsaw is important as the engine power is what determines the length of the chain it can use in a comfortable way. For example, if you have a lower powered chainsaw, it would struggle to work with a long bar. Whereas a more powerful chainsaw would be under-utilized if it had a shorter bar. Bar Length — Another one of the most important things to consider is the length of bar you want as this is what determines what the chainsaw can accomplish such as what size tree, wood, or branches it can handle, as well as the speed at which the chainsaw will cut them. A shorter bar with be quicker, however, a longer bar can cut thicker trees or lumber. The first thing you should do is consider what size of trees or wood you will be cutting and then decide which bar length you think would be the best at getting the job done. The weight of the Bar — In order to use a chainsaw correctly and safely, you need to make sure the weight of it is compatible with your body. A heavier chainsaw bar will make the whole thing heavier and maybe off balance, which could cause a problem for you. You do not want to be strained or fatigued while using a chainsaw as this is very dangerous. The lighter the chainsaw the more control you will have over it. Intended Purpose — The chainsaws on the market range from light-duty to heavy-duty there are many different tasks that they can carry out. Specifying what kind of job you want your chainsaw to do can help you to determine which type of bar you need. Brand — While branding is subjective, quite a few are held in high esteem when it comes to chainsaw manufacturing and this means they have quality assurance and high-quality products. Brands like Oregon, Husqvarna, and STIHL are the top brands on the market so you can be sure you’re getting the best products. Wear and Damage — Chainsaw bars are very prone to wear and tear as they are used on heavy materials which can sometimes cause damage to the bar and chain. If you use your chainsaw while having a damaged bar, it can make the whole unit malfunction. Therefore purchasing a new and functioning bar from a good, durable and high-quality source can help fix this problem. Better Performance — In order to gain better performance from you chainsaw you could change the bar length as this will increase the effectiveness of the chainsaw. Cutting into thick wood requires a longer and stronger chainsaw bar and so upgrading your chainsaw could help you complete these task with ease. The same goes for those who are performing smaller jobs and might need a smaller chainsaw bar. Updating Your Model — Say you have an older model of chainsaw and the bar is not as good or efficient as those out there now, there is nothing stopping you from changing that bar so your chainsaw can perform well again. Every chainsaw has wear and tear and every new upgrade will give your chainsaw a better performance so you can attempt those jobs it might not have been able to manage in the past. In conclusion, there are many chainsaw bars to choose from, which could make anyone feel overwhelmed when trying to find a replacement for their chainsaw, but hopefully, with this chainsaw bar guide, we have helped you to come a little closer to finding what you need. With all of the chainsaw bars on the market and all their different attributes, it’s difficult to know which to choose from, which is why we also gave you a buyer’s guide. Now you can keep in mind the first steps towards finding a chainsaw bar that is suitable to you, with the correct type of chainsaw, bar length, bar weight, and the purpose of it in mind. This should end with you purchases a bar that is perfect for your chainsaw and can help you with the tasks at hand in an efficient and effective way. The products we have spoken about in this guide are all top of the range products which have lots of pros, as well as cons. So whichever you choose from in this list, we know you are getting a great product as they are all high-quality and durable. 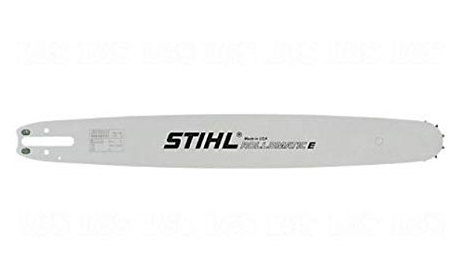 Whether you choose to go for the Oregon 20 Inch Replacement Chain Bar for its compatibility and advanced features, or the STIHL Rollomatic E Laminated Chainsaw Bar 20 inch for its ease of use and unique star shaped sprocket, you will get a product you can depend on. Finally, there are many benefits to purchasing a new chainsaw bar, aside from the fact that it might just need replacing, considering to do so will also give you added benefits. For instance, changing the chainsaw bar can improve performance and efficiency as well as updating your model to incorporate better abilities to do the tasks at hand.